Becoming a sports coach is an excellent ambition for anyone who is driven by success and loves sports. Sports coaches need to be driven, dedicated and above all confident in their team and their abilities. Sports coaches may work in a wide range of locations, from neighborhood baseball to college football teams. A sports coach is required to get the most out of their team, regardless of the level they are playing at and apart from anything else that may be affecting their performance. Sports coaches are often well-educated and have a degree associated with sports. 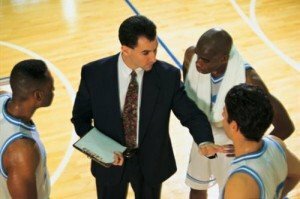 Overall, the sports coach is responsible for their team’s performance and are required to do everything and anything they can do to create better players and a better team. Sports coaches are often well-educated and have a degree associated with sports. Most sports coaches will have a Bachelor’s Degree or even a Master’s Degree regarding sports, but some of them will simply have years of experience. Sports coaches that aspire to work with very famous or popular teams will need to prove throughout their career that they can get very good results. The most successful sports coaches are coaches that do a lot with what is perceived as very little. A sports coach will strengthen their team through training and strategies. The coach is required to be extraordinarily knowledgeable about the sport and need to understand the individual strengths and weaknesses of all of their players. Without this core knowledge, the sports coach will not be able to reliably create success. Success is extremely important, but a good sports coach will also need to be able to help their team through their failures. Coaches are very strong individuals that need to keep an entire team motivated and ready to do their best. For this reason, a coach needs to have very good social skills and needs to be able to motivate their team even when they are in dire straits or have no actual chance at success. Coaches need to be able to push for their team under very bad circumstances and often need to be able to push their team towards success even when they have fallen behind. This is a very unique skill set and it is extremely demanding. How Do You Become a Sports Coach? Becoming a sports coach is usually not altogether difficult if you begin in the lower ranks. The lower ranks of sports coach are usually in high school coaching or coaching for colleges that do not put an emphasis on their sports teams. However, advancing as a sports coach can be more difficult. Becoming a sports coach can be made easier with the acquisition of a degree. Those without a degree or experience may begin to break into the field by volunteering as a coach. Volunteer coaches are organized by institutions like the National Alliance for Youth Sports. This will give a coach a good idea of what is necessary to truly succeed within the field. Those interested in the field may want to acquire their national coaching certification, which is provided by the United States Sports Academy. How Do You Advance as a Sports Coach? Advancement as a sports coach usually occurs through success. If a coach can show that their teams are successful, they will become sought after by college recruitment centers and more. The best coaches are paid millions of dollars to ensure the success of a team. Coaches that have failures but still manage to get ahead will also be considered good coaches.